What have unions done for us lately? What have unions done for us lately? The answers may surprise you. 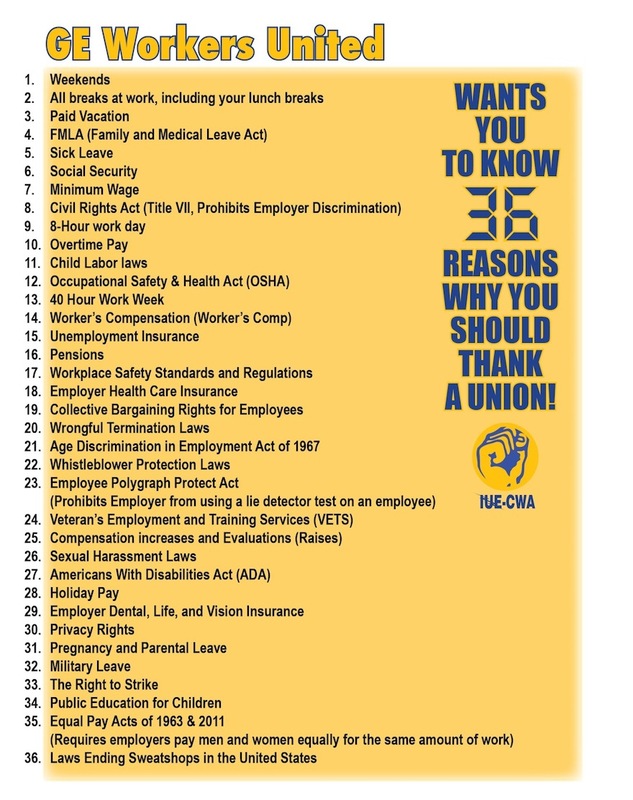 Unions have long been part of our nation’s history, fighting for better pay, safer working conditions, health care and retirement benefits, education and civic participation. Unions have brought diverse voices together, and their struggles have elevated the working conditions, the standard of living and the recognition of not just their members, but of all who labor. Unions played a major role in ending the sweatshops and child labor so common at the beginning of the 20th century. The International Ladies’ Garment Workers’ Union, or ILGWU, was one of the first unions to have a primarily female membership. And in the aftermath of the tragic Triangle Shirtwaist Factory fire in 1911, in which more than 100 mostly young immigrant women were killed, the ILGWU was at the forefront of reforming working conditions and pushing for comprehensive safety and workers’ compensation laws. Unions aren’t a “thing of the past.” They’re a vital part of our social fabric and economic future. Did you know, for example, that unions run the largest career training program outside the military? Union apprenticeship programs generally partner with employers or industries to provide the kind of training that hard-wires excellence into workers and places them in good jobs that can support families. That’s worth a lot when unemployment is stubbornly high and personal incomes are falling. I challenge you to watch this quick video about union-trained military vets who are rebuilding the World Trade Center without getting misty-eyed. WE CAN MAKE A DIFFERENCE BY BEING ACTIVELY INVOLVED IN OUR UNION! We all understand that collective bargaining and organizing are difficult in today’s economic environment. Gaining a fair share for our members in bargaining has never been easy or automatic, even at profitable corporations such as General Electric. As IUE-CWA members, however, we are part of a larger community, and when things get tough, we stand up and fight for each other. 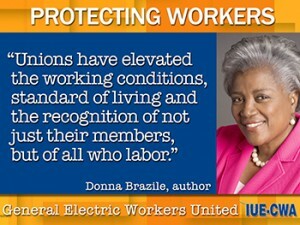 That’s what being part of the labor movement has always been about. 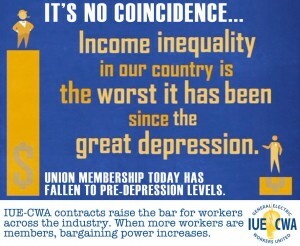 IUE-CWA provides opportunities to build better lives for ourselves and our families. Because we have a union contract and the legal right to act in unity, we can join together and build more leverage at General Electric than any of us could do individually. We won’t win on every issue every time, but every time we fight together, for each other, we grow stronger. 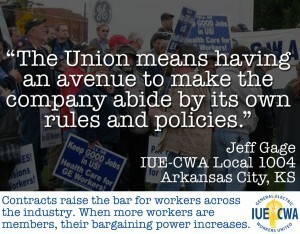 That’s why we refer to ourselves as General Electric Workers United. 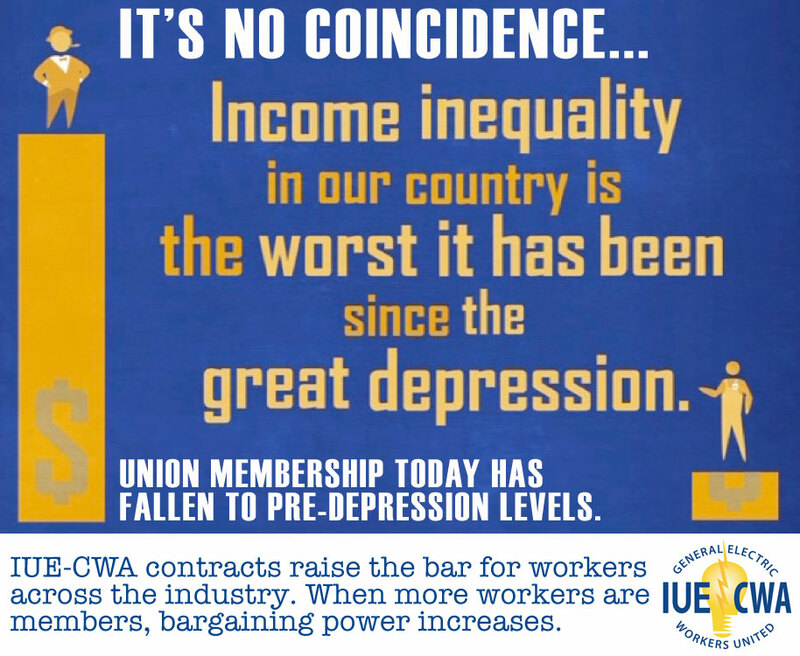 The General Electric Workers United Campaign has the short-term goal of mobilizing our members around the 2015 GE contract negotiations and the longer-term objective of building worker power by engaging more IUE-CWA members in the affairs of our Union and the broader social and political movements that can improve our lives. Because we have a national contract with General Electric, we’re already starting from a better place than workers at non-union companies. Our Agreement establishes rights, wages, and benefits that cannot be changed by management without first negotiating with us through our elected union representatives. Unless we make sure the Company follows the contract it agreed to, we’re giving away some of its advantages and giving the Company too much control. Get to know your contract! 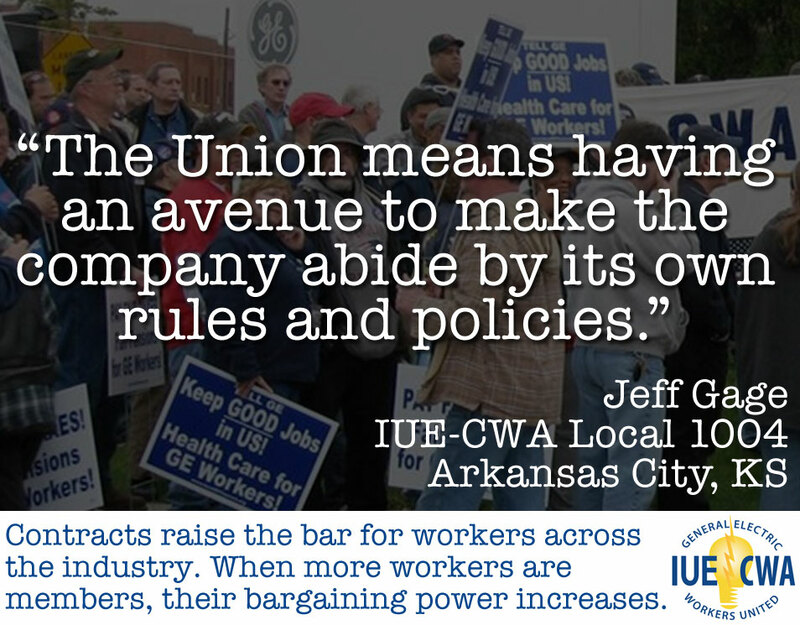 The IUE-CWA GE National Agreement is available online here. We also have the right to act as a group to address workplace issues. U.S. legal protections for unions and collective bargaining came about only after a long history of worker activism and struggle. Current law gives employees the right to act together to improve their pay and working conditions or fix job-related problems. Any time a manager tries to interfere with that right, you should alert your shop steward or mobilization coordinator. If you are threatened with or fear discipline, you should stop the activity, but be sure to report it as soon as possible. The right to representation, also known as “Weingarten Rights. If a manager wants you to defend your conduct or to ask questions that could be used as a basis for discipline, you have the right to have a steward present. Before or during the interview, clearly tell the manager you want representation. Being covered under a collective bargaining agreement provides you with rights and protections not afforded to non-union workers. While General Electric typically extends most of the wage and benefit improvements we negotiate for our members to its unrepresented American employees, it does not extend them all. In addition, union workers have protections that do not apply to unrepresented GE workers. The wages and working conditions for employees at GE’s North American competitors vary widely, but are generally lower than those enjoyed by our GE members.